If you are on Facebook, you know that there is a “wall” where you state your status. Well, I can tell you loud and clear that my status is “I love Scrapple”. No, they did not have it in Puerto Rico when I was growing up. They still don’t have it but that would be the perfect place to introduce it. It might go well with their “morcillas” which are blood sausages. I ate scrapple for the first time here, in the States, and fell in love with it immediately. Today someone told me that she needed to acquire a taste; not me. Another one, Colleen, told me that she did not like to eat something with that much fat. Well, it has less fat than bacon. I like it in different ways. 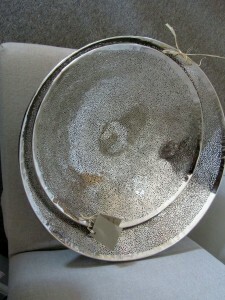 One being as a side dish; crispy and thin. The other one is a scrapple sandwich. I like thin, white bread and I again, will have the scrapple very thin, crispy and a dollop of ketchup. Hey, that’s my taste. 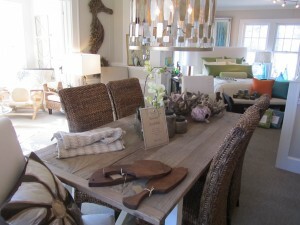 I few of my good friends get together from time to time for breakfast at Crystal in Rehoboth Beach. They don’t mind me mentioning their names, Roberta, Debbie, Missy and at times Alice will join the group. I always say I am not having scrapple. I need to be on a diet; but the moment Missy asks for a side order of scrapple I can’t help it. I immediately order it myself, as well. No willpower, really. When I heard that Dirty Jobs was doing the show on scrapple I could not believe that my favorite Rapa Scrapple was not the one. 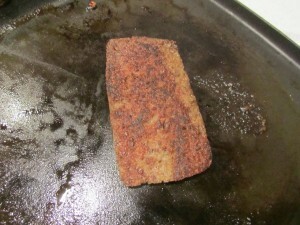 Then I read than the nephew submitted Hughes Delaware Maid Scrapple, located in Felton. That is where the show will take place tomorrow on the Discovery Channel at 9 p.m.
A good friend, Tyler, sent me the promo link http://www.delawareonline.com/article/20110128/entertainment/101280304. Giant is the market where I buy pretty much my groceries and they sell Rapa Scrapple, Milton, and Kirby & Holloway. Rapa is my favorite but that is my personal opinion. 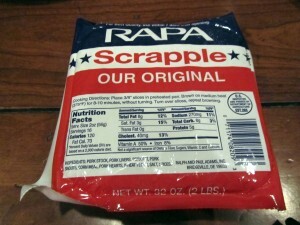 Rapa Scrapple has been in business since 1926; Ralph & Paul were the two brothers that started this pork product. The location is Bridgeville, Delaware and it is the largest producer of scrapple in the world. Please visit www.rapascrapple.com. 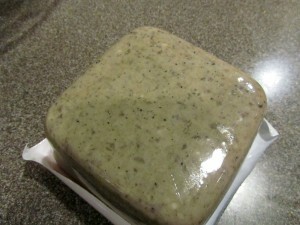 The website is full of information including a recipe for Scrapple Breakfast Burrito. Every year the town of Bridgeville hosts the Apple Scrapple Festival. Every year I say I am going but never go. It celebrates the town’s heritage of apple orchards and scrapple manufacturing. It is usually held in October. Maybe this year Missy and I will make it. The Delaware News Journal mentioned some of the restaurants in Delaware that take scrapple seriously. But, one of those mentioned, Helen’s Famous Sausage House in Smyrna, takes it to a different level; a Scrapple Sub for $7.20 that has 4 slabs of scrapple, accompanied with lettuce, tomatoes, onions, pickles, hot peppers, sweet pepper, mayo or oil. 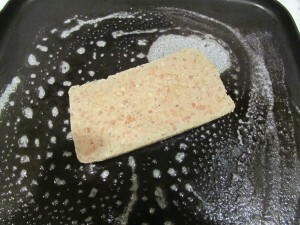 I am writing Rapa Scrapple. Because of one ingredient, wheat flour; anyone with a gluten allergy cannot eat this delicacy. I hope they can make one substituting the wheat flour for rice flour or any flour that is gluten free for that matter. Cannot wait for the show tomorrow. Should be interesting. Talk to you later….you know I will….. I did not know what heading to give this post but I think the one I finally gave it was perfect. I was driving north on Rt. 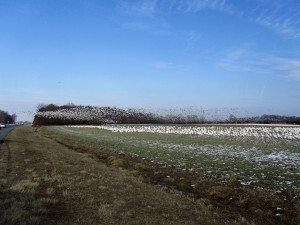 1 today and the combination of a cold winter’s day, the snow geese and all the vast farmland reminded me how lucky I am that I can call Delaware home. I grew up in the island of Puerto Rico but I have now lived in Delaware longer than I lived in the “Isla del Encanto”. Delaware is a Small Wonder. It is also one of those states that have everything. It is small, that, it is, but I like it that way. 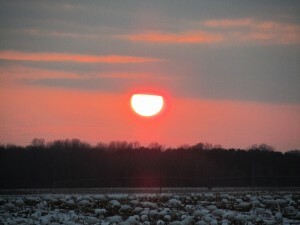 Delaware has so much to offer, the arts, museums, hotels, Dover Downs (NASCAR), entertainment, medical facilities, air force, beaches, bays, the Lewes Ferry, historic towns, fishing, surfing, crabbing, quaint coastal towns, farmland, poultry, low property taxes, no sales tax and even gambling. I love the idea that I have so much space. 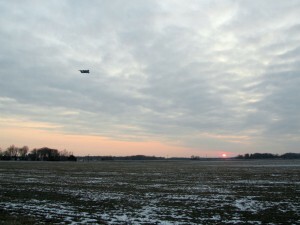 Delaware is pretty much flat; more so where I live, in Sussex County. You can see for miles. Todays was such a day. 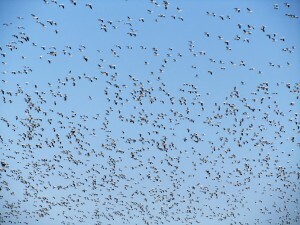 While I was driving I came upon a gigantic flock of snow geese. For a moment you would have thought it was snow. 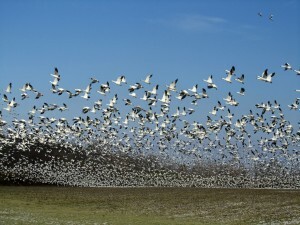 The snow geese breed in Greenland, Canada, Alaska and the northeastern tip of Siberia; winter in warm parts of North America. They mate for life, feed in flocks, nest in colonies, migrate in large flocks, and females will return to the place they hatched to breed. The young feed themselves but will stay with their family until they are 2 to 3 years old. I pulled to the side of the road and got out and then they were all over. 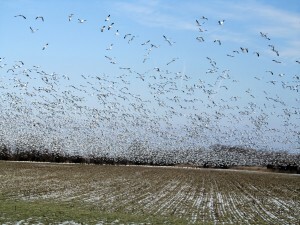 Here are the pictures of these geese. 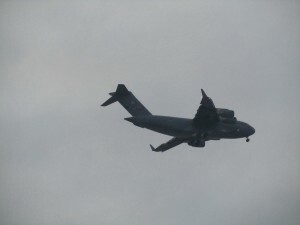 A few hours later, at dusk, I saw one of the big airplanes of Dover Air Force base coming back to the base. The scenery at that time of the evening was just so pretty; a day’s end. Peaceful…have a good one…talk to you later…. 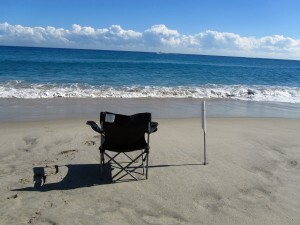 This post is for the people visiting Delray Beach and Palm Beach County. 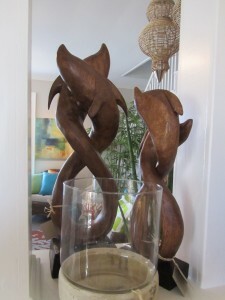 As I have mentioned more than enough times, Delray Beach is the perfect town for visitors. If you are lucky enough to be a resident, then you already know this. This Village by the Sea offers the perfect vacation spot because it has it all. I love walking the town but for this post I needed a car. I have written about the wetlands before. But, it is good to mention them again, since this website is written in a blog style; you might forget or saw the pictures but never read the content of the post. I do have a few friends that do that, believe me. 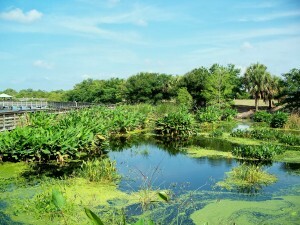 Someone mentioned to me that I needed to visit the Wakodahatchee Wetlands. They said the birds are beautiful and throughout the year you can watch birds in their nests and new life showing its face. There are 2 wetlands, not far from each other. 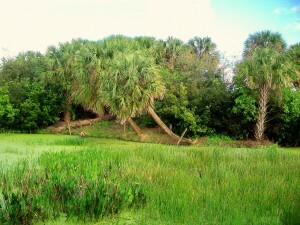 One is called Wakodahatchee in suburban Delray and the other is called Green Cay Nature Preserve in suburban Boynton Beach. Wakodahatchee means “created waters” and this is exactly what this is. Fifty acres have been transformed into a wetlands ecosystem. 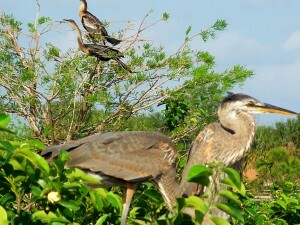 And since its transformation turtles, frogs, alligators and many species of birds call this nature preserve home. It is located at 13026 Jog Rd. It is a little tricky but not that hard. You need to go west on Atlantic Ave., crossing over 95. Continue until Jog Rd and turn right. 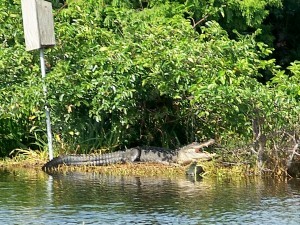 Go through the intersection of Lake Ida and about 1/4 mile on the right you will see it. The sign is not very big, though. This is the southeast side of Palm Beach County Water Utility Department’s Southern Region Operation Center. Tel. 561-493-6000. Website? 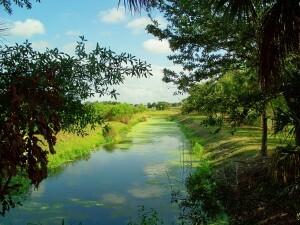 http://www.pbcgov.com/waterutilities/wakodahatchee/location.htm. It opens from 7 a.m. until 7 p.m. It is the perfect place to relax, walk and enjoy nature. It is free. 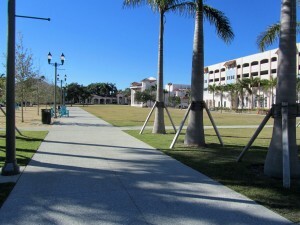 The 3/4 mile elevated boardwalk takes you through twists and turns, all the time enjoying the view. It is quiet and there are areas to rest. You will see photographers, walkers and someone just sitting and relaxing, taking in the scenery. 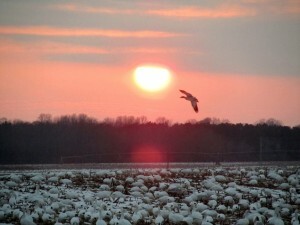 I like it in the early evening; the birds are coming for the night. Same type of setting as Wakodahatchee; but bigger. Ninety acres of nature preservation. 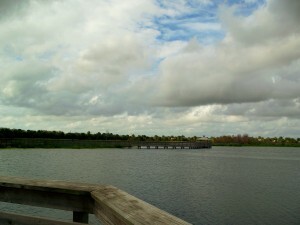 Green Cay is located at 12800 Hagen Ranch Rd. 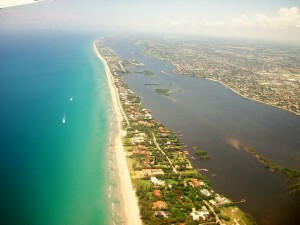 It is suburban Boynton Beach between Boynton Beach Blv. and Atlantic Ave. This elevated wetland boardwalk is 1.5 miles long. It winds through the wetlands and it really is the perfect place to take in a walk either early in the morning or late in the afternoon. It is open every day from sunrise to sunset. 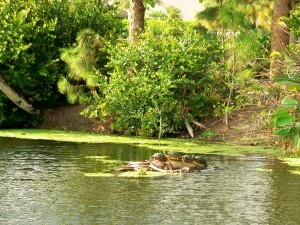 The actual Nature Center is open Tuesdays through Fridays from 1 until 4:30 p.m., Saturdays from 8:15 until 4:30 p.m. and on Sundays from 1 until 4:30 p.m.
For more information please visit http://pbcgov.com/waterutilities/waterfacts/green_cay.htm. If you have gone to the beach, walked the town, eaten, shopped, then get in your car and check this out. It is never boring; it changes every second of the day. It is worth it. 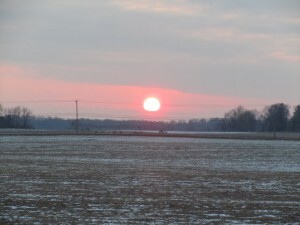 Have a great day….talk to you later…..
Well, if we can get through the month of February, we will be in great shape. If you are visiting this week-end the Beaches, it is cold; but very pretty, as well. Even though it is cold and quiet at the beaches, as I was walking my dog, Addy, this morning I noticed buds on the pear trees. I hope that is a sign that winter will not last another 6 weeks. Wishful thinking? I think so. Monday, 1/31 – At the Lewes Library, located at 111 Adams Ave., “A Random Soldier”. This book was written by Milton, Delaware, Teri Clifton. Teri Clifton will read from and discuss her book, which was written on behalf of her son, Chad, who did not make it home from Iraq to tell his own story. It will be at 7:00 p.m. and the sale of the books will benefit the library. For more info. please call 302-645-4633. Wednesday, 2/2 – At the Lewes Library is Special Music Storytime, at 10:00 a.m., by singer and songwriter “Miss Jackie” McCabe. The winter songs and stories program will feature winte-themed stories and music. The program is free ans suitable for infants, toddlers and children up to elementary school age. Wednesday, 2/2 – Once a month the Rehoboth Beach Film Society, the Lewes Public Library and Movies at Midway are the sponsors of a film series called Around the World. It features acclaimed, award-winning international independent films. At 7:00 p.m. It is free. Location? The upstairs screening room at Movies at Midway. For more info., please call the Film Society at 302-645-9095 or the Lewes Public Library at 302-645-2733. This Wednesday’s film is Bomber. It is a bittersweet comedy. Alistar and Vallerie have been planning a special trip to Germany for a very long time. When their son Ross stops by the house to send them off, happenstance turns into an impromptu family road trip of the most tortuous kind. Alistar berates Ross for all that he is not in life, while Valerie tries to keep the peace. It is soon discovered that Alistar’s reason for the often comic sometimes painful trip is to shed a guilt he’s been carrying for years. Ultimately, the family learns they need each other more than they imagined. Not rated, Runtime is 85 minutes. Thursdays, 2/3, 2/10 and 2/7 – Salsa for Seniors and Argentine Tango. At the Cape Henlopen Senior Center, 11 Christian Street, Rehoboth Beach. The Tango class will be held from Noon until 1:30 p.m. and the Salsa class will be from 1:30 p.m. until 2:55 p.m. Each 3 hour series is $25 or $20 for senior center members. Reservations are requested and no partner is necessary. Contact Ivonne Cimo at Dance Moves and Manners at 302-222-3755 or visit www.dancemovesandmanners.com. I went on the website and there are so many classes for all ages. If you like to dance, please do go on the website and check it out. I have friends that have taken the Tango class and have had too much fun. Please visit the website www.clearspacetheatre.org. Tuesdays, February 1st until April 12 – Classes for Children – Catch the Theatre Bug. Broadway Bound. All levels. There will be a final performance on Tuesday, 4/12 at 5:30 p.m. 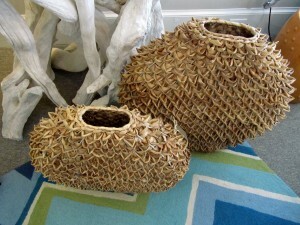 This 10 weeks of classes are $175 and will be from 5:00 – 7:00 p.m. Classes will be in dance, voice, acting and more for all ages and experience levels taught at the theatre by professional actors and educators. 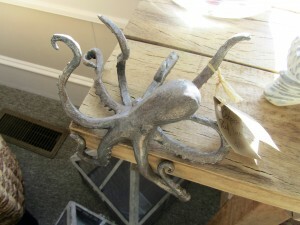 The theather is located at 20 Baltimore Ave., Rehoboth Beach. This semester, Clear space welcomes guests instructions to incorporate new concentrations in costuming, play-writing, improvisation and much more. 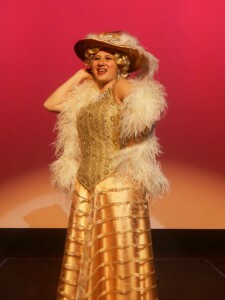 February 3 – 5 and 10 – 12 at 7:00 p..m. and February 6 and 13 at 3:00 p.m. – This is She’s No Angel: Clear Space Presents Mae West Story in “Dirty Blonde”. This show is part Mae West biography, part contemporary love story. For more information and for tickets please check the above mentioned website. February 19th – Cashore Marionettes Kick Off Clear Space Guest Artist Series as the first entertainer. Joseph Cashore fills dual roles of puppet craftsman and puppeteer. He had his first marionette at the age of 11. 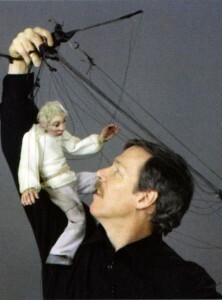 He started performing as a full-time puppeteer in 1990. Two shows in his repertoire, Simple Gifts and Life in Motion, will be presented at the Clear Space Theatre. Simple Gifts is a series of poignant scenes from everyday life set to stunning music. Simple Gifts provides an entertaining and sensitive vision of what is to be human. Life in Motion is intended for a more grown-up audience. This show contains even more exciting marionettes. Saturday, 2/19 – Simple Gifts begins at 3:00 p.m. and Life in Motion will begin at 7:00 p.m. Tickets are $10 – $30 and are available on-line on the above mentioned website, by calling 302-227-2270 or by visiting the box office Tuesdays – Fridays 9:00 – 5:00, at 20 Baltimore Ave.
Have a great day….talk to you later…. 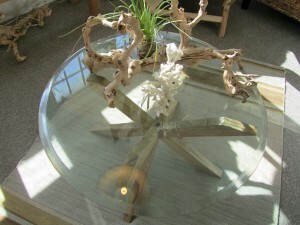 Back on October 26, I wrote a post on a furniture consignment shop called Seaquels in Ocean View, Delaware. 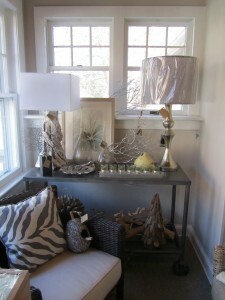 The store is owned by Cindy and Kathy. By the way, if you want to see that post just click on the month of October, 2010 and scroll down to the 26th. These two ladies sent me an e-mail. 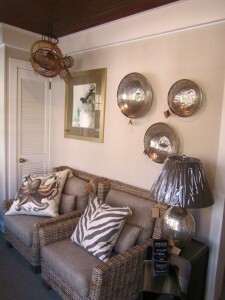 They thought I should go and visit White Orchid Interiors as possible material for my blog. 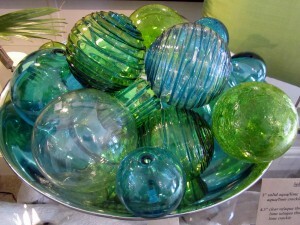 They thought the store looked beautiful and readers might like to find out that there is another choice for their decorating needs, among the ones that already exist in our Delaware beaches. Word of mouth; again, is the best advertisement. Well let me tell you more about White Orchid. 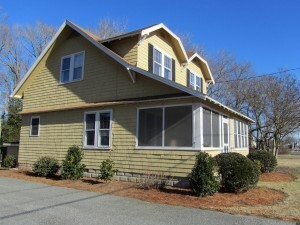 First of all, it is located at 83 Atlantic Ave., Ocean View, DE 19970. Tel. is 302-541-4044. Website? 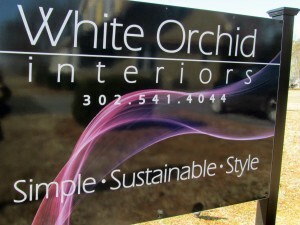 www.whiteorchidde.com. It is so easy to get to because all you have to do if you are driving on Rt. 1 is get to Bethany Beach and right there at the intersection of Rt. 1 and Rt. 26 just go west for about 2 miles and you will see it on the right hand side of the road. It is a house and at the beginning I did not know where it was but once I saw it I, definitely, knew where I was. 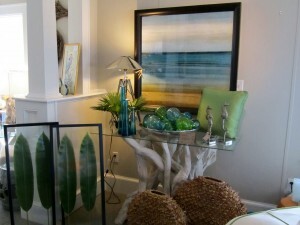 Because this showroom was a home, it has that look and ambiance; you move through the different rooms of a house. 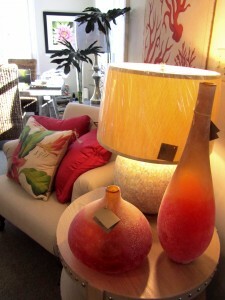 Even though it is an interior design shop, furniture, home accents, and art are available for purchase on the spot. Nothing makes a store shine more than the people that work in it. 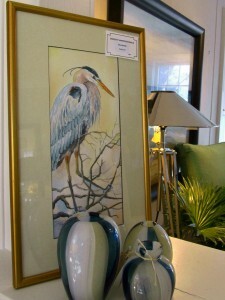 In this case the owner, Leslie Bixler. It was the first time I had met her and immediately I felt at ease with her. She is friendly and exudes confidence. You can tell she loves what she does. She is not new at this type of business. Leslie ‘s background is in retailing, marketing and advertising. And she is a very busy lady. 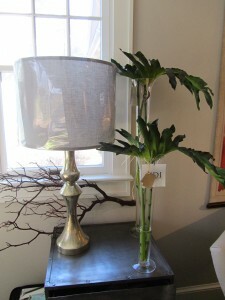 The store features metals, natural seagrass, lamps, luxury bedding, designer pillows, and mirrors, among many other accessories. 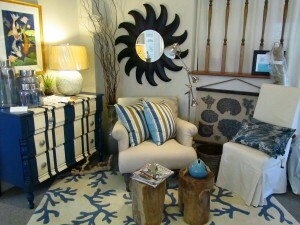 White Orchid Interiors is eclectic and stylish; the way the store is decorated radiates proportion and symmetry. Leslie offers services like residential space planning, custom window treatments, paint consultation, wallcoverings and in home design services. 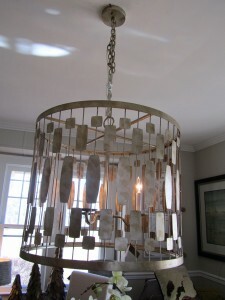 Most important is that her designs skills cater to a variety of interior styles while working within your budget. I remember one time a friend of mine who is a decorator told me that if your budget has no limits then for a designer it becomes a very easy job. It is when a limited budget is in place that a designer really becomes a creator of sorts; innovative, showing taste, style and class. 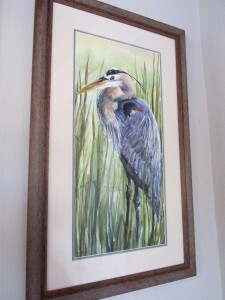 Her local art is original; one being the watercolors on her wall. 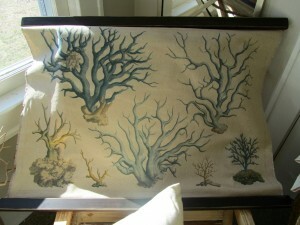 They are by Dorothy Harrison Braun, who is her mother. Mrs. Harrison offers private and group instruction and you can call her at 302-539-2045. I took so many pictures thinking I would only put a few on my post. But, I really liked them all and what better way to show White Orchid than by showing some of the pictures of this very unique interior design shop. As I was leaving I kept thinking about my own style. It is a mix of several styles which make my own look, I guess. Casual and easy; that’s it. I also remember reading a quote “Style comes from within and is a reflection of your character and preference”. Could not have said it better myself. Have a good one! !…Talk to you later…. Looking out my window…. all I see is dark skies, rain, wind; probably cold, but have not been outside yet even though, Addy, my dog, is looking at me with skeptical eyes. I had not posted a recipe that I made the other day because I was looking for the perfect day; I think today this post is perfect. 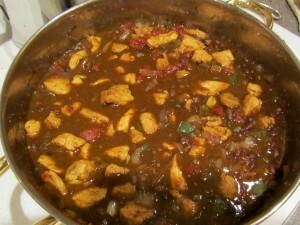 The recipe has Ancho Chili Powder. If you are wondering if it is going to have too much heat, don’t worry because ancho chili powder is a ground powder made from the poblano pepper. It is called ancho when it is dried. It is also dark, smokey, with rich flavor. It is considered mild, so perfect if you don’t like too much heat; just enough. There are times when a poblano pepper could have more heat than usual, though. You won’t find that in this dish. The recipe also uses Cumin Powder. This spice has origins from the East Mediterranean to East India; used in many types of cuisines. During the Middle Ages it was thought that the use of cumin would keep the chickens and lovers from wandering….. It is also the second most used spice, after black pepper, in the world. You can either prepare the dish with the whole boneless chicken breast or cube them, like I did. If you like thighs better then get the ones that are already deboned; you will get more meat. Season the chicken with salt and pepper. If you are on a low sodium diet, then you know what you need to do. In a heavy skillet heat 2 tablespoons of the olive oil over medium high heat. Add chicken and sear until well browned on both sides. Transfer the chicken to another plate. Then, reduce heat to medium. Add 2 tablespoons olive oil to the skillet. Add 2 cloves of garlic, 1 cup diced onion, 1/2 cup green pepper, 1 tablespoon of chopped jalapeno, if desired. Then saute for a couple of minutes. Add 1 tablespoon ancho chili powder and 1 tablespoon of cumin. Continue to saute on that medium heat until fragrant. Add 1 1/2 cups chicken broth, bring to a boil and add 1 can petite tomatoes, drained. Bring to a simmer. Cook until slightly thickened; about 6 minutes or so. Then add 1 can black beans. Return chicken and juices to the skillet; reduce heat to low. Simmer until heated through; nice and hot. At this point, if you would like to add the cilantro, then do so. 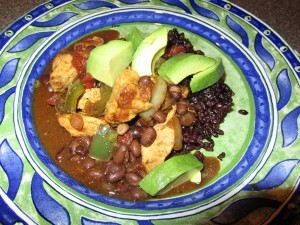 Serve it over rice and garnish with cubed avocado. Rice: You can use any rice you like. 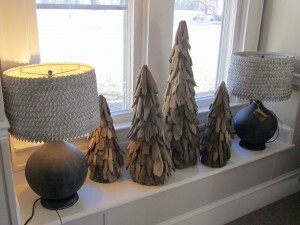 I used on this particular night a blend of black and mahogany rice, Lundberg Black Japonica. It is grown in the Sacramento Valley. Please note that this recipe is gluten free. Just remember, make the recipe your own. You have the basic recipe, but if you like more juice, or less beans, or more tomatoes, then experiment and enjoy it. I was driving that beautiful road from Rehoboth Beach towards Bethany Beach when I saw the banner. It was telling me that I should be looking forward to a new restaurant in our Beaches. SoDel Concepts was advertising their new restaurant. 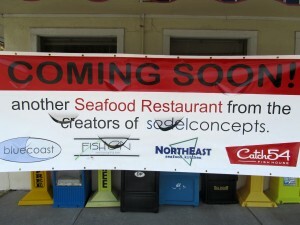 This one will be joining already several restaurants owned by SoDel. I cannot wait. Their food is consistently fresh, tasty and delicious. Tower Shores, that’s where the banner was. 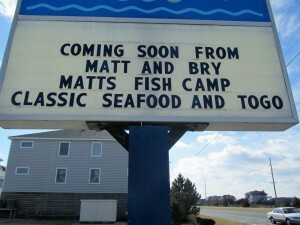 Then I looked up to the marquee and it said Matt’s Fish Camp. I started thinking about fish camps. 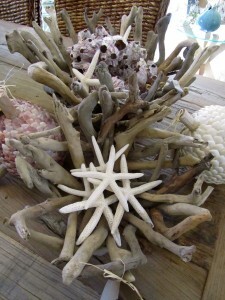 Oh, they are local favorites and hidden jewels located at times off the beaten path. Well, known in the south. In them, you can find the freshest catch of the day. Fish camps were, really, sheds; anglers could fry their catch of the day. 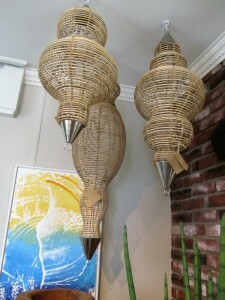 As restaurants, a lot of them are ‘no frills” establishments; but they are cozy, casual and welcoming. I am wondering what kinds of sides they will have. 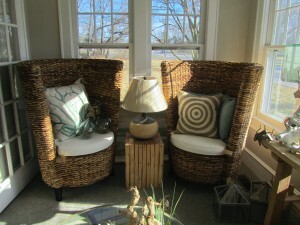 As I look outside my window, it is so sunny here at the Delaware Beaches; just an illusion because it is really like 15 degrees. So, writing a post about Delray is definitely the thing to do. If you are visiting Palm Beach County you might want to check a few of the upcoming events in Delray and vicinity. I have told you before that Delray Beach is the type of coastal town that has it all; the unobtructed beaches, the shops, the restaurants and definitely, the entertainment. A little bit for everyone to enjoy. One thing this town does very well is its festivals and fairs. I have never seen a town that can close a main street and fill it to capacity with vendors, musicians and artists in a blink of an eye. When is all over done with, it comes down just as fast as it went up. Thursday, 1/27 – It is Art & Jazz On The Avenue – Once a month, during the season, and on a Thursday, live musical entertainment is what you will hear and experience On the Avenue. 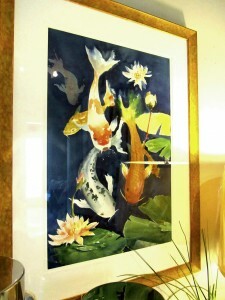 Open house specials, and gallery exhibitions are among the many things to enjoy. Even though it is On the Avenue, it will also extend to the SW 5th Avenue Plaza. More info? 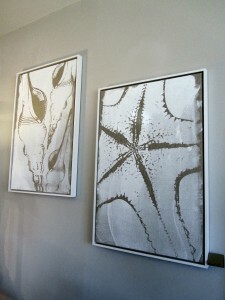 Please visit www.downtowndelraybeach.com/Art-and-Jazz. Thursday, 1/27 and continuing with the celebration of the Art & Jazz on the Avenue, there will be an Organic Wine Tasting at Nutrition Cottage. When in Delray I visit this Health Food store because they carry so many gluten free items; more than in any other place I have visited near Delray. Their organic wine tasting will be from 7:00 p.m. until 9:00 p.m. This wine tasting is called “Ravishing Reds”, just in time for Valentine’s Day. Nutrition Cottage is located at 407 E. Atlantic Ave. Tel. 561-272-8571. Website is www.nutritioncottage.com. 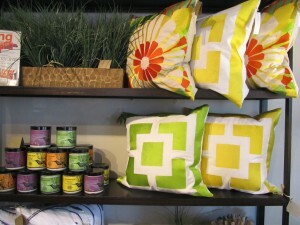 Nutrition Cottage is more than a healthfood store; it is also a juice bar and cafe. Thursday – 1/27 – At the Entertainment Pavillion at Old School Square, 51 N. Swinton Ave. you will find Rock the Avenue: The Heavy Pets. They are an American Rock ‘n Roll band known for their catchy tunes and powerhouse performances. This is a FREE outdoor concert in partnership with Delray’s Art & Jazz event. Time? 7:30 p.m. until 11:00 p.m. More info? Please visit www.oldschool.org. Friday, 1/28 – Murder at the Beach – Booksigning – 7:00 p.m. 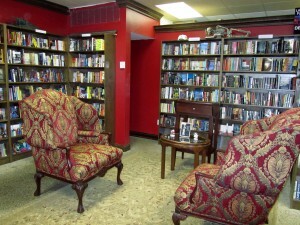 If you enjoy reading as much as I do, this is the coziest murder mystery bookstore you will find in Delray. 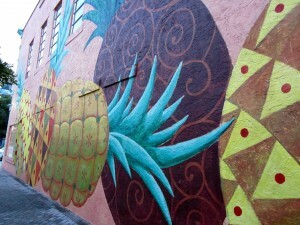 Located at 273 NE 2nd Ave. (Pineapple Grove). Tel. 561-279-7790. Website is www.murderonthebeach.com. On Friday, author Ian Vasquez will be signing Mr. Hooligan. His book is about Riley James, who was small time, just a kid, running messages and money for the Monsanto Brothers, the real players in Belize City. Then one slip in judgment left 2 men dead. The Monsantos handled the situation for their young protege…but accepting this favor put Riley inescapably in their debt. Now, 2 years later, he’s a pro picking up drug drops under the Coast Guard’s nose and guiding boats through the reefs. He wants out…. The author, Ian Vasquez was raised in Belize but resides in Tampa, Florida. Please note that Murder on the Beach has the largest collection of Florida authors that specialize in murder mysteries. Friday, 1/28 – All Shook Up at the Crest Theatre, Old School Square located at 51 N. Swinton Ave., Tel. 561-243-7922. Website is www.oldschool.org. All Shook Up is Footloose, Happy Days and Grease, all rolled into one national tour. It is the zany story of mistaken identities, romance and rebellion through the power of rock ‘n roll music. Friday’s performance is at 8 p.m.
Saturday there are 2 performances; one at 2 p.m. and one at 8 p.m.
Sunday’s performance will be at 2 p.m.
For tickets and information, please call or visit www.oldschool.org. Friday, 1/28 – Gallery Walk starting at 7:00 p.m. until 10:00 p.m. – This event gives visitors and residents an opportunity to see what an art community Delray Beach really is. The participating galleries, and there are many, will offer wine and cheese and will stay open extended hours so that you can get to know them better. This Gallery Walk is every Friday. 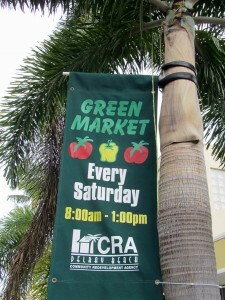 Saturday, 1/29 – Just like every Saturday you will find Delray Green Market open for business. The location? SE 4th Ave., 1/2 block south of Atlantic Ave. They will be there from 8 a.m. until 1:00 p.m. 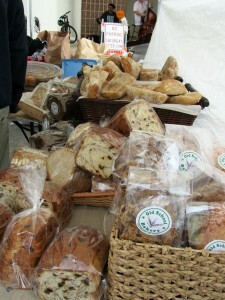 It is an open air market filled with local produce, baked goods, foods, music and flowers. Best way to start your Saturday morning. More info? 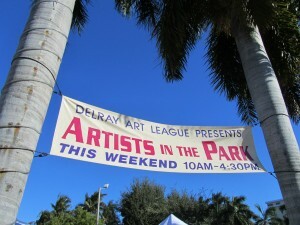 Call Lori Nolan at 561-276-711 or visit www.delraycra.org. 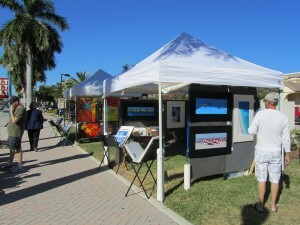 Saturday, 1/29 and Sunday, 1/30 – You will find Artists in the Park pretty much every week-end. 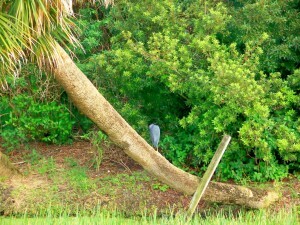 The location is Veterans Park, right there at Atlantic Ave., at the Intracoastal. It is a free outdoor festival where you can browse and relax. 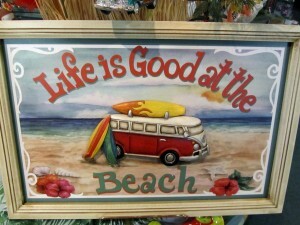 Have a great time…enjoy that Village by the Sea…kick back and relax…that’s what you are there for….